Melt Down & Remade — Christina Made It. I was asked to melt down an existing gold ring that had been inherited to turn it into a wedding ring. As most of you know I always say yes to everything and as always this is something I had never done before. This is the original ring. 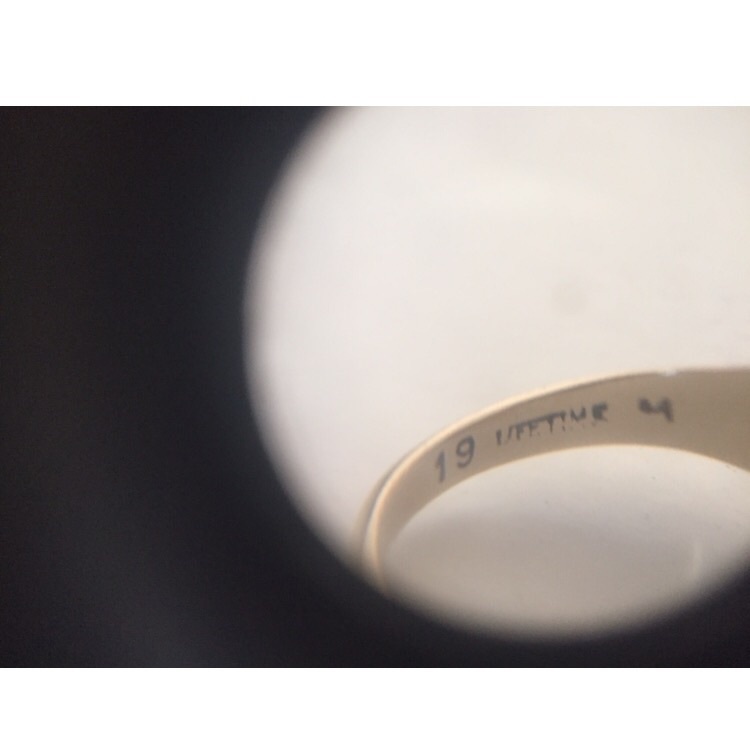 On the other side of the ring was the markings "19 lifetime" and the maybe a "4"? I think this is a lifetime guarantee stamped by the brand that made it but I have yet to find which brand uses this stamp. There were a number of options for ways to melt it. This was a bit of a made up way. I cut the ring into pieces. Using a heat proof block, a channel was made for the the lengths of the ring in the hope that it would melt into a long line to make it easier to shape later on. This theory worked a little but I hadn't anticipated how much 'working the metal' (hammering and shaping) would be involved. Definitely worth trying to melt it as close to the shape as possible early on. So this is the ring.... The black marks are just on the surface which will come off during the shaping process. 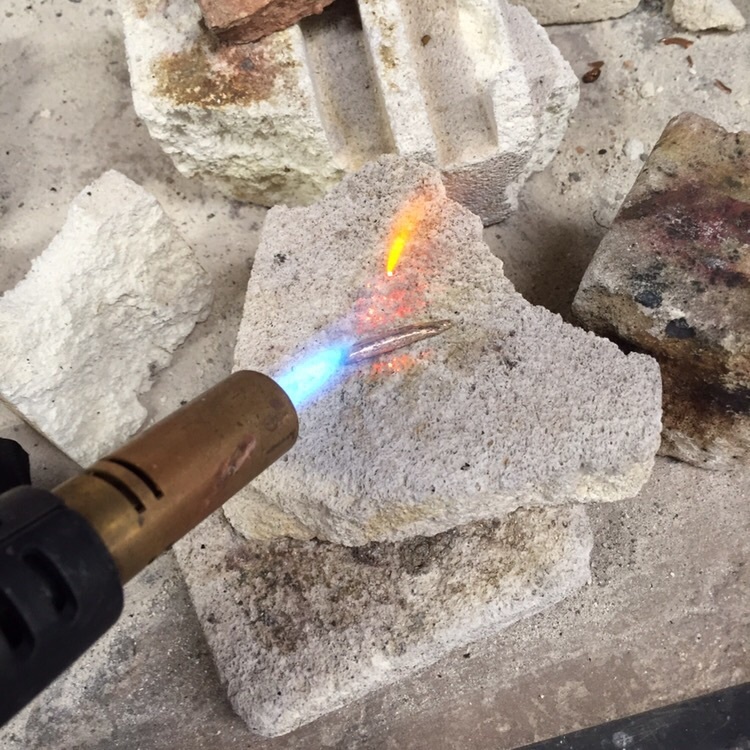 The piece is annealed; heated to a high temperature so the the metal is softer. 9ct gold is a VERY strong metal. I started to put it through the rollers, but it could only go through once before it would have to be annealed again. Each time you do something to the metal it's known as 'working' it, the metal gets stronger, this is called 'work hardened'. I put it through the rollers about 5 times which flattened it slightly, with the aim of making it longer. After annealing it again, it went into the drawing plates. This is a metal plate with various shaped holes changing in size. I had to start with the biggest holes and work my way through 20 of them, one at a time! The grips clamp onto the gold and is drawn through the plate using a winch at the other end. Each time the metal has been drawn it has to be annealed again. With the 9ct gold being so strong, I managed to break the cable twice. The cable got replaced twice before they decided to use a whole new set up, which luckily I didn't break! I also used this tool a few times, it's a steel block with a half round groove which I hammered it into. This gives it a flat end on one side and a curved end on the other, improving on the shape the draw plate was creating. I gave the gold a sand so I could see how it was going to look. Now it's starting to take shape, the ends are cut off and filed down. Some 'pi' was used to calculate the length (thickness + required ring diameter) x 3.142 The length is cut to size using the Digital Vernier for accuracy. Using some solder I heated the join with the blow torch. 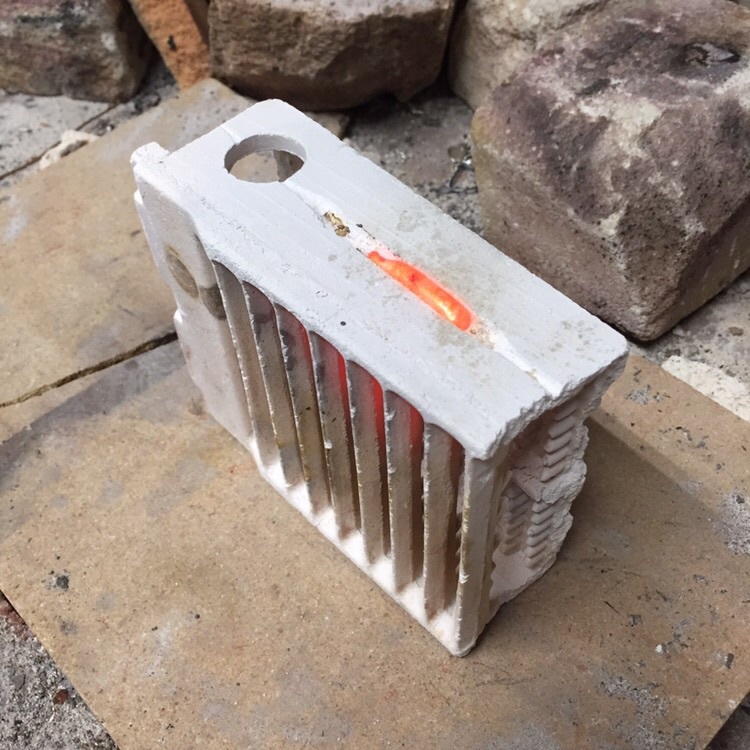 Once it has joined securely and pickled in an acid solution to clean up the residue left from the heating process, it can be shaped around a steel pole (I think it's called a triblet) with a rubber mallet - again so that the metal is not damaged during the process. As you can see below it's staring to become round, more like a ring. Lastly, my favourite part of the ring-making is polishing it up. This involves 4-6 different levels of sandpaper, then an abrasive polish on the Dremel (Tripoli) and to finish a buffing polish (Rouge). The customer wanted a brushed finish on this occasion so after the polish, fine sandpaper is used to slightly dull the shine and the entire ring is coated in wax to preserve the matte finsish. Here is the finished result, a remade ring from melting an old ring, solid 9ct gold men's wedding band with a matte finish and stamped with my hallmark.